Up until a few months ago, we literally had games all over our house. Some were in our bedroom or in the kids' bedrooms. A few were on bookshelves and in drawers in the dining room. And a lot were in the basement on various shelves and in various cupboards. When we started organizing our basement several months ago, we consolidated our games to the basement (with just a few exceptions). We sorted out which games were for our kids and which ones they were not old enough to play yet. And of course we purged some. 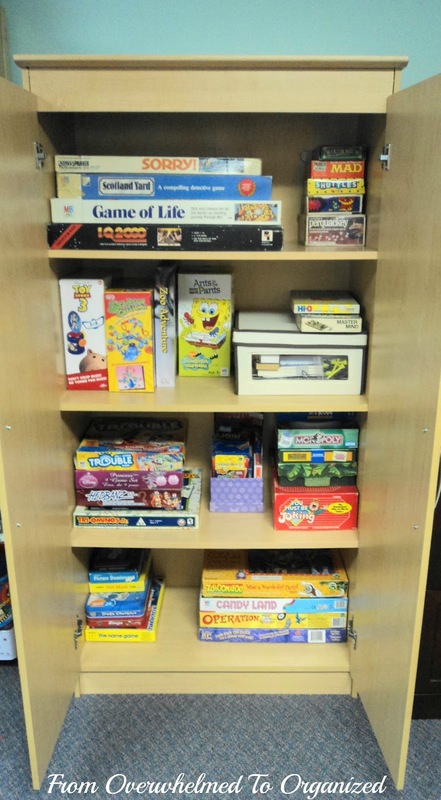 We kept all the older kids / adult games on shelves in our furnace room (I'll show that some other time), and we put all the kids games into a cupboard. Here's what it looks like now. Look at them, all crammed in there! It's a better organizational system than when they were on shelves because now I can close the doors and hide everything, but it gets cluttered in there when the games are piled too high. Some of those piles have 7 or 8 games in them! That's too big a pile for kids to easily get out a game from near the bottom. Some things are hidden too so I'm sure they don't get played with very often. When the cupboard gets too full, it's also harder for the kids to put games back themselves, so they often end up staying on the floor. Or they put them back on the top of a pile, even though the game is bigger than some of the others in the pile, so the pile topples and then there's a mess of pieces everywhere. It can be overwhelming! As part of having a balanced summer, I wanted to ensure our games were easy to access so they would be played. So, time to sort, purge, and reorganize this games cupboard! My daughter helped me purge a lot of games that she's outgrown and my son finally agreed to let go of some he had been holding on to for a long time but didn't play. We still had a lot of "spin and move around the board" types of games that are great when kids are 3 or 4 and are just learning to play games. I checked the games to make sure they still had all their pieces and that nothing was broken. Luckily, everything seemed to be in good condition still. OK, so here's our giveaway pile. Yay!! This will clear lots of space in the cupboard to organize it better. I also made a "Relocate" pile for items that really didn't belong in a games cupboard. Most were toys that will be moved to a shelf for larger toys (still working on that!). And we had this cute little chair that my inlaws brought back from Africa for us that was tucked away on top of the cupboard once when my daughter fell off it. It just kind of stayed there after awhile but she was excited to have it back on the floor again! After emptying and sorting through the cupboard, I wiped it out and organized the games going back in. I tried to make piles of similar sized games so they could be put back anywhere in a pile (usually on the top) rather than having to go lower in a pile to avoid toppling things over. I also tried to only put 4 to 5 games in each pile. That way, they can get each game out easier and there's less likelihood of games falling out when one is pulled from the bottom of a big pile. And, I stood up a few games that have vertical boxes (why fight gravity?!). 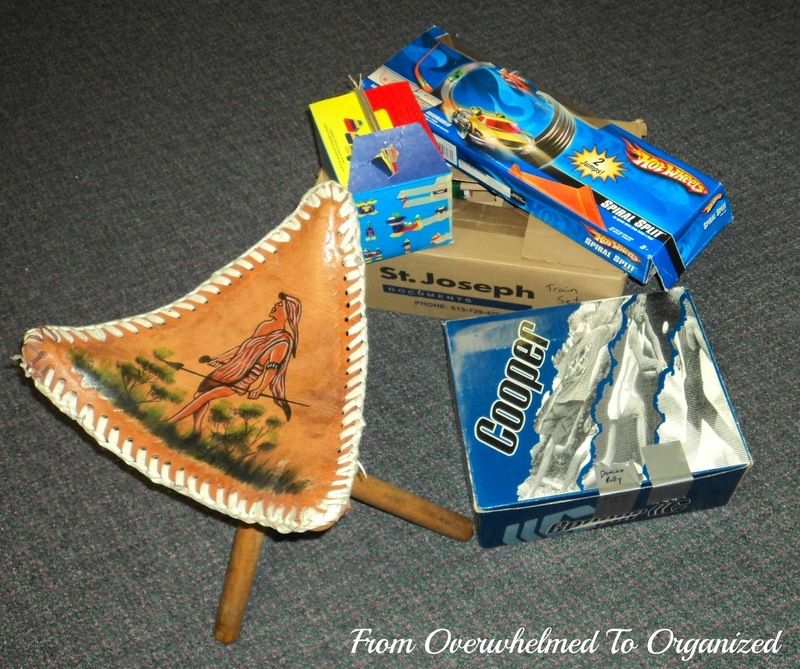 That beige and brown fabric covered box contains brain teaser games and mind-bender type games and activities. Once in awhile we'll pull it out and put on our thinking caps to figure them out. And that little purple box contains various small boxed games and card games. It helps keep them all contained and when we want to play one of them we just pull the box out. It makes me smile just looking at how much more empty space there is now! My philosophy of organizing used to always be to use every possible inch of space available but now I'm really coming to appreciate the beauty and practicality of open space. It looks much less chaotic and makes it so much easier to keep things organized. 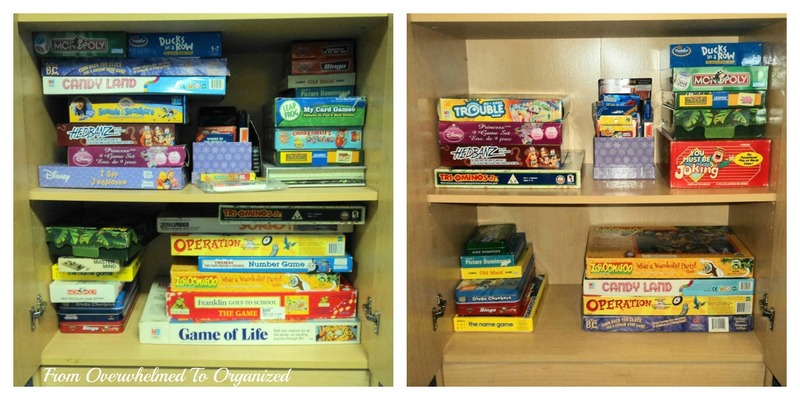 So hopefully this makeover will help this games cupboard stay organized! 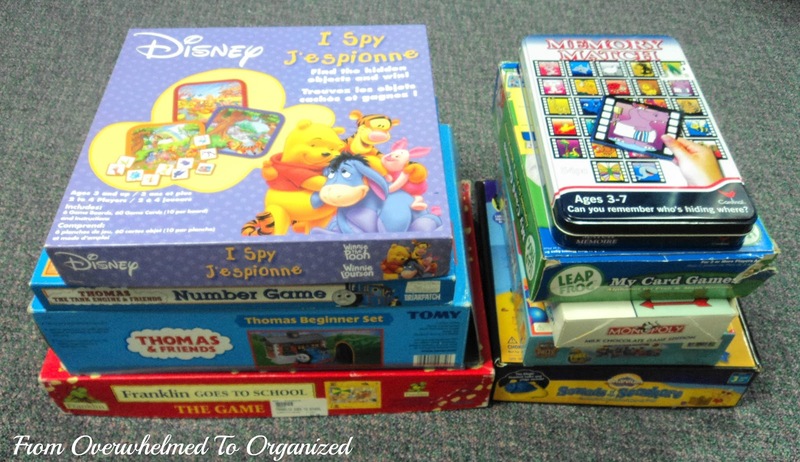 I'm looking forward to playing lots of these games with my kids this summer and beyond. Do you play a lot of games? Do your kids? 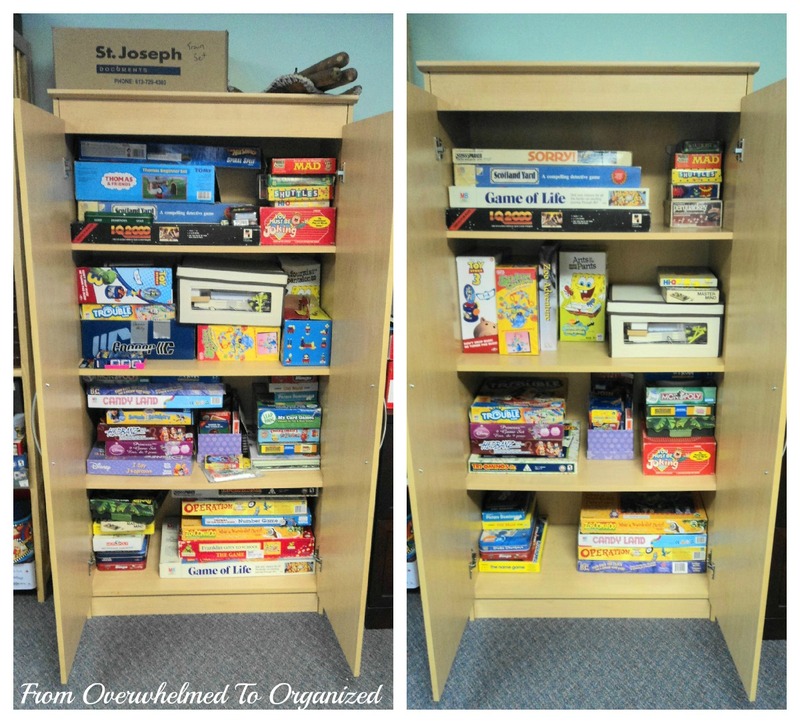 How do you organize games at your house? And do you compartmentalize your time like I usually do? Or are you able to stop and play when your child wants you to? I would love to hear your stories! Love it! I need to do this. Our games are spread out around the house and I get discouraged because some of them are bizarre shapes, like Pirrahna Panic and oh how I wish I could just throw out the Moon Sand! Thanks for the motivation, I think I'll tackle this next! Thanks Jibberblog! 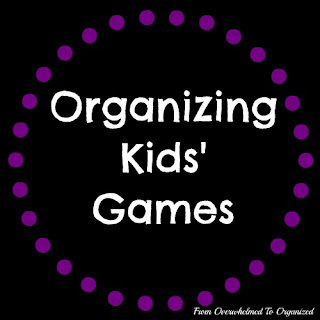 I don't know why kids' games have to be such different sizes...makes it so hard to organize them :) Good luck organizing yours! That's a great way to stay on top of the clutter Nan! I'll make a note to link up to your party in August. Thanks for visiting & commenting! 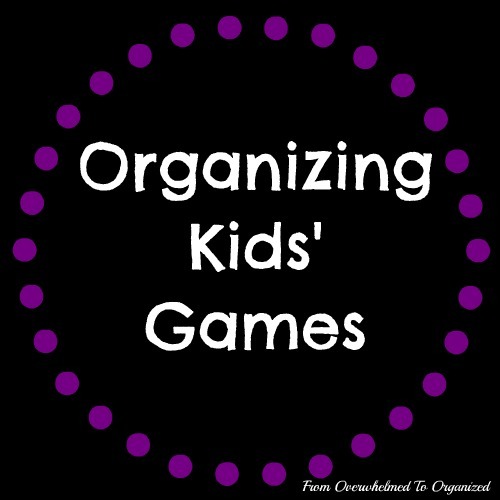 I think it is a great idea to sort those game studd with your kids. 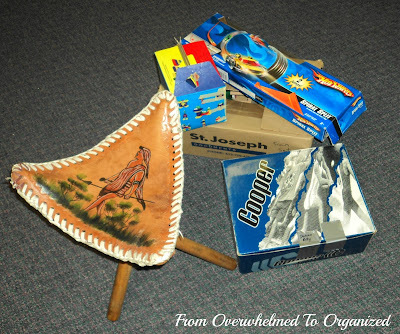 In this way, you are training your kids to let go of something they outgrown or they dob't use anymore. Plus, it is a great bonding moment! It was neat to do this with my kids Myric! I don't want to force them to get rid of things but they're starting to see how much easier it is to find and enjoy what they have now. My son still likes to keep things but my daughter is looking at it more for how other "little" kids would like it more than she does now that she's "big". It's kind of cute :) Thanks for commenting! The carpets for our basement are being installed tomorrow and then we will be able to start unpacking some boxes which has lived in storage for 2 years. 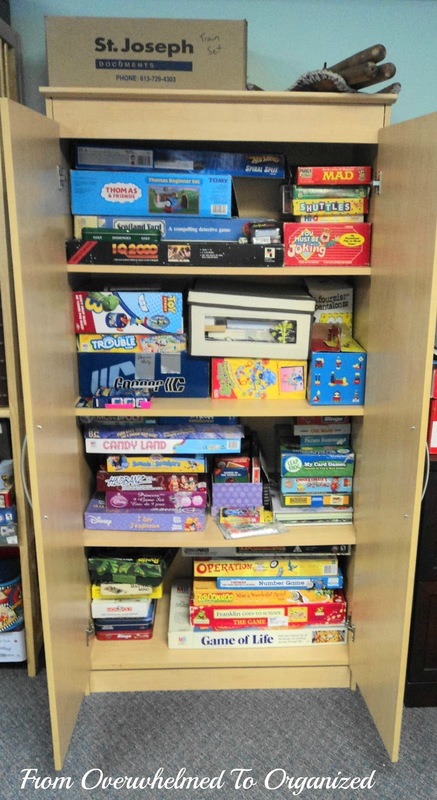 There are many games in the boxes and I am going to try and be as ruthless as possible and only keep those that are age-appropriate and that we really enjoy to play. No more hanging on to stuff for sentimental or "maybe one day" reasons. We have done this recently, too! We sorted and purged and donated...it took 2 full days. I have a range of ages, 8-15, so the games are pretty varied. We removed many from their boxes and put all the piecea with directions in gallon bags - we included a picture of the game as well for easy identification. This allowed us to put many games vertically in a milk crate type basket - we have 3 full. Card games went into plastic soap boxes we labeled ans put into a cd storage box. So much easier to find stuff now! Wow mksandb! You did a thorough job! I like the bags idea. That would really save a lot of space! I also like the cards in soap dishes with labels. I may do something like that for our card games because some of the boxes are getting pretty worn out. Thanks for visiting and sharing your ideas! You've been busy organizing! Great job. Thanks for sharing at the All Star Block Party. Thanks Holly! Yep, I'm on a roll. Still have lots of organizing projects to go but I'm getting there :) Thanks for commenting. Hi there! I'm visiting from All Star Block Party. I need to do this so badly!! I have tons of games and because the kids play them an put them away they get in disarray. I am now a new follower and would be honored if you would visit and follow me back at http://lifeofblocks.blogspot.com/ Thanks! Looks fantastic... I love organized anything.... it's just so nice when there's a place for everything and everything in it's place.. Good Job!!!!! Thanks for sharing this at the ALL STARS BLOCK PARTY!!! Thanks Carri! I'm working on helping my kids understand the "place for everything & everything in its place" concept. They're starting to get it :) It really helps when I can set them up for success with the purging & organizing. Thanks for your comment. So simple, yet so effective. Great job! Thanks for linking up to Titus 2 Tuesday. Hope to see you again this week! Hey there! I just found your cute blog via the hop and I'm your newest follower! Also I'd just love to invite you to check out a huge giveaway I'm having right now!! Hope to see you there! Thanks so much lady! Looks great, thanks for sharing at the Our Favorite Things Link Party. We have a ton of games that I need to sort through. Thanks for the inspiration. It's probably pretty common Tabitha. I'm just working on trying to live in the moment a bit more often than I used to. Thanks for your comment! We do play games but now that my oldest is six I feel like we can play a lot more. Great job organizing - it looks great! Thanks so much for sharing at Mom On Timeout! Thanks Trish! Six is a great age for games :) Thanks for commenting. We went through our toy cabinet and shelves a year ago - time to do it again, and you've motivated me, thanks! This is great! Having such an orderly collection makes it way more likely someone will be tempted to play one of the games. Thanks Janet! We've paired down our games collection since then as they've outgrown some and have grown into others. But the systems I put in place 6 years ago are still working! Not stacking too high, grouping games of similar sizes, baskets for all the card games, etc. 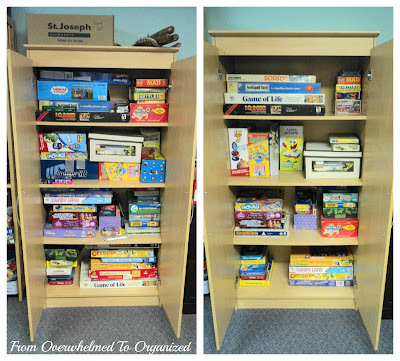 Not only do we play games more often but we can keep this cupboard organized as we take them in and out.